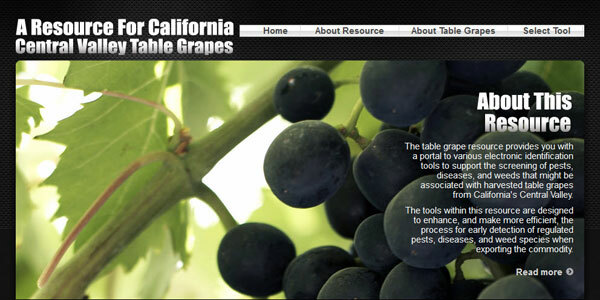 A Resource for California Central Valley Table Grapes, a commodity-based identification resource, was created to provide growers, the industry, and those associated with table grape trade activities an easily accessible site to link to digital tools developed by, or to be developed by, USDA's Center for Plant Health Science and Technology (CPHST) and others. This resource offers users a variety of media, such as keys, images, and fact sheets, to support the screening and potentially the identification and diagnosis of often diverse groups of pests and diseases associated with a specific trade product—in this case, table grapes. The table grape resource, when completed, will include two types of identification tools: 1) a symptom-based tool to support field screening and identification of diseases and physiological disorders based on the visible symptoms they cause on their hosts (the grapes); and 2) taxon-based tools to support screening and identification within a particular group of organisms (weed seeds, spiders, arthropod pests, and the grape varieties themselves). The resource currently offers a link to Identification Tool to Weed Disseminules of California Central Valley Table Grape Production Areas, a guide to weed disseminules that may be found in the grape clusters. More information about this and the other tools can be found in the resource.